To this end, I’ve been working on compiling a list of rhetorical analysis questions to help students think critically. While I’ve used “text” for the sake of consistency, you could easily substitute “speech” or “visual.” (Same with “author” and “speaker.”) The questions are organized by the acronym I use for analysis, PASTA+SOS. (Pasta sauce!) Enjoy! What is the rhetorical situation? What events or occasions created a need or opportunity for this text? What is the cultural context for this text? What is the author’s intention? How does the author’s relationship with the audience limit or support the purpose? Does this text effectively meet its purpose? Who is the primary audience for this text? Who is the secondary audience for this text? What values does the audience hold that the author seeks to appeal to? What is the audiences’ relationship to the subject of the text? How does the author anticipate the audience’s needs? How does the author anticipate the audience’s response? What are the experiences shared by the author and the audience? What are the values shared by the author and the audience? How might the audience perceive the author’s intention? Does the author make assumptions about the audience that hinder the argument? What is the central idea or assertion of the text? What are the principle kinds of arguments used? What are the principle lines of reasoning (logic) used? How does the author appeal to emotion? How does the author appeal to reason? Is the data used to support the argument qualitative or quantitative? Is the data used to support the argument reliable? Is the data used to support the argument valid? What background information is provided to help the audience understand the subject? Is it adequate? What are 2-3 words that describe the tone of the text? At what point(s) do(es) shift(s) in tone occur? What is the function of the shift(s) in tone? What is the effect of the tone at the beginning of the text? What is the effect of the tone at the middle of the text? What is the effect of the tone at the end of the text? How does the tone impact the author’s credibility? How does the tone impact the audience’s reception of the message? What is the overall effect of the tone? How does the author present him/herself? Is the author speaking on behalf of another entity? How does the author establish credibility? Does the author seem knowledgeable? Does the author seem fair? How does the author treat people who disagree? How does the author treat people who agree? Does the author use stereotypes? Does the author reveal prejudice? What are the author’s professional affiliations? How might they impact the argument he/she makes? What are the author’s personal affiliations? How might they impact the argument he/she makes? How does the author’s reputation influence the reception of his/her message? How might the author have insight into the subject that the audience doesn’t have? How might the author’s understanding of the subject be limited? What is the arrangement of the argument? (Classical, Rogerian, other) OR How is the work organized? Does the organization of the text complement the subject? Does the organization of the text complement the purpose? How does the conclusion reinforce or extend the purpose? How does the conclusion involve the audience? What concepts are repeated? How does this develop the argument? What information do the longest sentences in each paragraph convey? How do they develop the argument? What information do the shortest sentences in each paragraph convey? How do they develop the argument? Is the argument inductive or deductive? If concessions are made, where in the organizational structure do they occur? What is the effect of their placement? What patterns exist in the author’s word choice? What patterns exist in the author’s sentence structure? Does the text tend to be concise or verbose? How does this impact the conveyance of meaning? Is the author’s approach to central idea objective or subjective? How does the author use diction to emphasize information that supports the argument? How does the author use diction to minimize information that detracts from the argument? How does the author use syntax to emphasize information that supports the argument? How does the author use syntax to minimize information that detracts from the argument? What rhetorical devices are used? What is their effect? Is the language formal or informal? How does this meet/not meet the audience’s needs? Does the author use satire? What is its effect? Does the author omit but imply key words, phrases, or ideas? What effect does this have on the meaning of the text? Are the descriptions/images concrete or abstract? How does this contribute to the argument? If you’re an ELA teacher, you might like the game I made based on these questions. I wrote about it in this post, which also includes a freebie just for my blog readers. 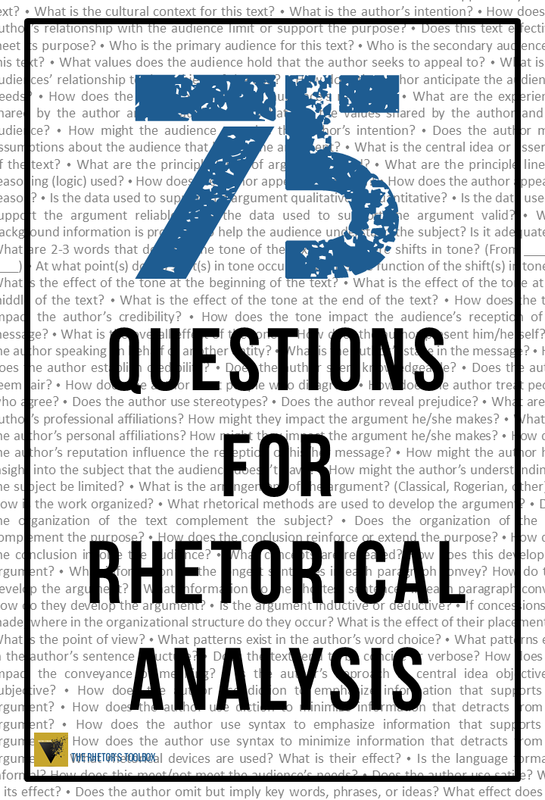 What’s up,I read your blog named “75 Questions for Rhetorical Analysis – The Rhetor’s Toolbox regularly.Your writing style is awesome, keep doing what you’re doing! And you can look our website about ظ…ظ„طھظٹ ظ…ط§ظƒط§ â€“ Multi-maca ظ…ظ†ط´ط· ط¬ظ†ط³ظٹ ط·ط¨ظٹط¹ظٹ ظ„ظ„ط±ط¬ط§ظ„ ظˆط§ظ„ظ†ط³ط§ط،. This is awesome! Thank you for taking the time to compile these questions for easy access. I look forward to working with my students with these. This is really helpful. Kudos!